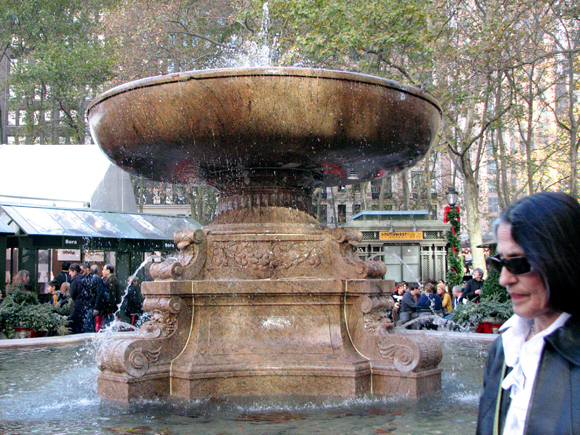 According to Ann Cumer, Bryant Park Corporation archivist, the fountain was originally intended for Corlear’s Hook Park in the Lower East Side — where Shaw Lowell had done the majority of her work — but was instead erected in Bryant Park on the east side, near the William Cullen Bryant monument, and behind the New York Public Library. As part of the 1934 Robert Moses renovation of the park it was moved to it’s present location, at the west side of the park, near Sixth Avenue. 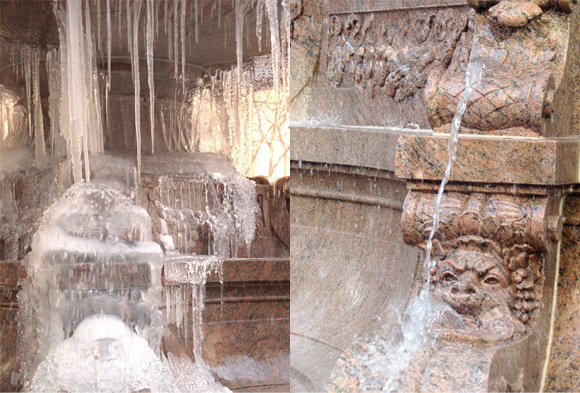 Ninety-nine years after its dedication, the Josephine Shaw Lowell fountain continues to amaze and inspire New Yorkers, local news stations, and numerous park visitors, especially during colder months when the fountain is winterized and turns into a magical frozen water sculpture. In warmer moths it also serves as an ad hoc wishing well. Every two weeks the park’s Josephine Shaw Lowell Memorial Fountain is drained for routine cleaning and maintenance of its filtration system. The process includes collecting all the coins from the bottom of the fountain, tossed in by park patrons and hopefully followed by wishes come true. Although the majority of the coins found in the fountain are U.S. pennies, along with a fair number of nickels, dimes, and quarters, there is always an interesting handful of foreign coins thrown in by Bryant Park’s visitors from all corners of the world. What happens to all the coins once they’ve been fished from the fountain? After a rigorous process of cleaning, drying, and sorting, they take a trip to the bank. After it is deposited, the money goes right back into the maintenance of Bryant Park. For more information and updates on the fountain, go to the Bryant Park Blog.